Bogota is huge! And looking down on it having climbed up to Monserrate (a church which sits 500m above the city) on day 2 reminded me of my size and insignificance; This was just 1 city of the hundreds of thousands in the world. Just one. I can get so caught up in my own little life and suddenly I felt so so small. My eyes were starting to open. I say 'starting to' because that was day 2. Now on day 3, they are open even wider. We travelled today (Thursday) to the Paraiso invasion to begin the family portraits. 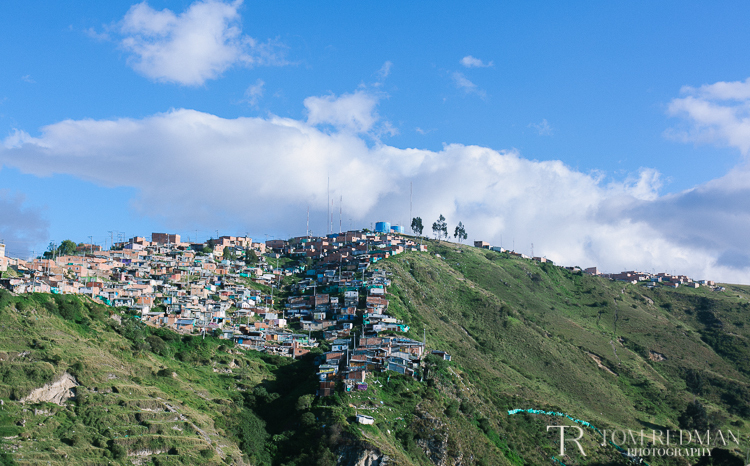 Our journey up the winding mountain paths in a bus took us past the growing slum (invasion) communities and we began to see the scale of the displaced people of Colombia. Literally millions live in tiny brick shacks that have been upgraded from the once corrugated iron huts that stood there 15 years ago. Families have spent years saving money to buy brick so that they can make their home more permanent. 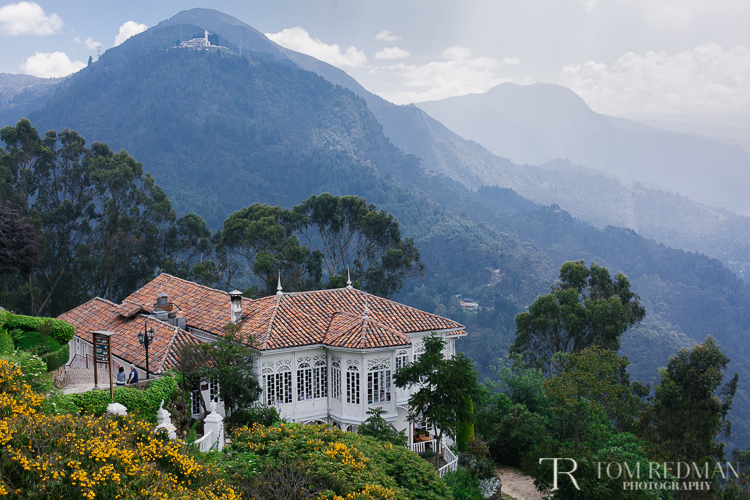 The invasion is cramped, dirty, infested with wild dogs, strewn litter and uneven steep roads. 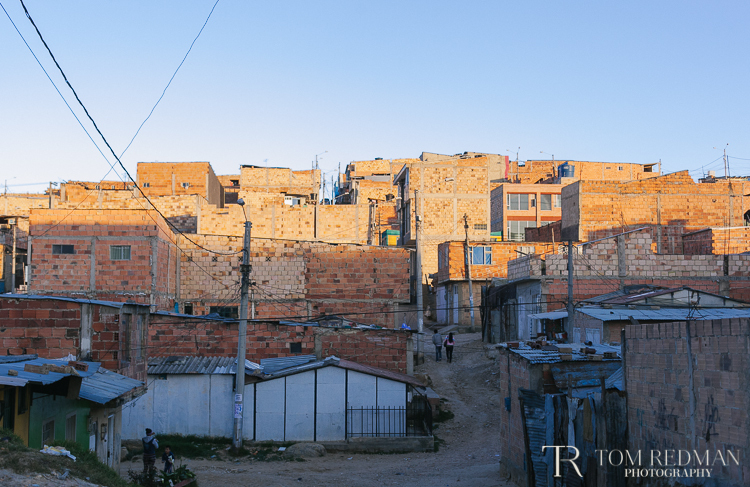 But then, like an oasis, described by the police as having 'transformed the community' is the Paraiso project. Run by a church pastor and his wife and two daughters, they provide children with a place to go when not in school. (Children only have the chance to attend school for half the day.) The project is somewhere for children to take extra lessons, play and do homework, somewhere to keep them off the streets. The project also has a dining service that feeds all those who attend. The church which is known by the whole community lies between these 2 buildings. 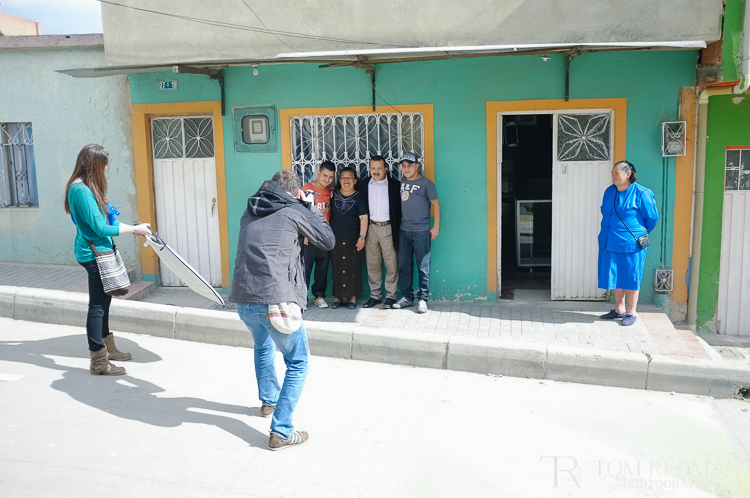 As we walked around the invasion to go and visit families for their shoot, Pastora (the pastor's wife who took us) was stopped by so many and fondly greeted. Over the last 15 years, since they started the project, the family have built up great respect amongst so many. The work they do in the community has literally transformed it. Its history, only a decade ago was gang crime, scenes of up to 11 youths lying dead in the street and complete lack of any hope. No one prioritised education and therefore had no dreams for the future. And now, because of the work of this family and the projects hey set up, this invasion now has hope and a better future. Contrary to it's reputation in the city, the people here are amazing. As we were welcomed in to so many family's humble homes, we realised just how incredible these people are. Generosity, humility and strength are what struck us the most. Their kindness, hospitality and appreciation of us visiting was sometimes too much to handle. Despite the frustrating language barrier due to our own incompetence and then the pause for translation, actions and expression spoke louder than words and we found ourselves fighting tears as they communicated their joy and strong faith to us despite such difficult circumstances. One lady called Luz Merida we visited runs a special needs school for 45 children. The parents of the children have no support other than the school that she set up. The building is tiny and there is no funding but her joy is infectious. Time and time again, as we heard different stories of different families, we were blown away by their resilience and attitude. I know we are just at the beginning of visiting these families but already, it doesn't feel like my eyes could open any wider or that I can feel any more humbled.